11/2/2016: This report has been revised to include updated data in categorizing white Protestants into the “white evangelical Protestant” and “white mainline Protestant” categories. Originally, the report relied partly on data from a previous wave of the American Trends Panel to make these categorizations. Cutting-edge biomedical technologies that could push the boundaries of human abilities may soon be available, making people’s minds sharper and their bodies stronger and healthier than ever before. But a new Pew Research Center survey of U.S. adults shows that majorities greet the possibility of these breakthroughs with more wariness and worry than enthusiasm and hope. Many in the general public expect continued scientific and technological innovation, broadly speaking, to bring helpful change to society. Yet when people are queried about the potential use of emerging technologies for “human enhancement,” their attitudes are not nearly as affirming. 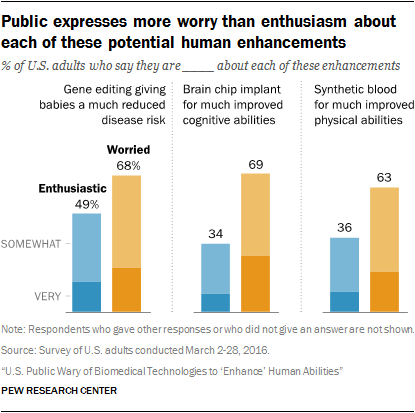 Majorities of U.S. adults say they would be “very” or “somewhat” worried about gene editing (68%), brain chips (69%) and synthetic blood (63%), while no more than half say they would be enthusiastic about each of these developments. Some people say they would be both enthusiastic and worried, but, overall, concern outpaces excitement. More say they would not want enhancements of their brains and their blood (66% and 63%, respectively) than say they would want them (32% and 35%). U.S. adults are closely split on the question of whether they would want gene editing to help prevent diseases for their babies (48% would, 50% would not). At least seven-in-ten adults predict each of these new technologies will become available before they have been fully tested or understood. Some 73% say this about gene editing, while an identical share says the same about synthetic blood; 74% says this about brain chip implants. Majorities say these enhancements could exacerbate the divide between haves and have-nots. For instance, 73% believe inequality will increase if brain chips become available because initially they will be obtainable only by the wealthy. In addition, many Americans think recipients of enhancements will feel superior to those who have not received them; 63% say this about synthetic blood transfusions in particular. By the same token, but more optimistically, half of Americans or more think recipients of enhancements will feel more confident about themselves. More adults say the downsides of brain and blood enhancements would outweigh the benefits for society than vice versa. Americans are a bit more positive about the possibility of gene editing to reduce disease; 36% think it will have more benefits than downsides, while 28% think it will have more downsides than benefits. Opinion is closely divided when it comes to the fundamental question of whether these potential developments are “meddling with nature” and cross a line that should not be crossed, or whether they are “no different” from other ways that humans have tried to better themselves over time. The survey data show several patterns surrounding Americans’ wariness about these developments. First, there are strong differences in views about using these technologies for enhancement depending on how religious people are. 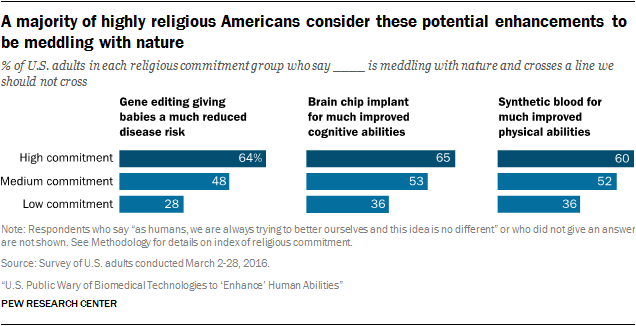 In general, the most religious are the most wary about potential enhancements. For example, those who score high on a three-item index of religious commitment1 are more likely than those who are lower in religious commitment to say all three types of enhancement – gene editing to give babies a lifetime with much reduced risk of disease, brain chip implants to give people much improved cognitive abilities and transfusions with synthetic blood to give people much improved physical capacities – would be meddling with nature and crossing a line that should not be crossed. Americans who have lower levels of religious commitment are more inclined to see the potential use of these techniques as just the continuation of a centuries-old quest by humans to try to better themselves. Second, people believe that technologies that would bring more dramatic or extreme changes to human abilities are less acceptable than technologies that cause less dramatic or temporary changes. For example, 47% of Americans consider the use of synthetic blood substitutes to improve physical abilities an “appropriate use of technology” if the resulting change to people’s speed, strength and stamina would be “equal to their own peak abilities.” But if the same enhancement results in physical abilities “far above that of any human known to date,” far fewer (28%) say it would be an appropriate use of technology. The same pattern occurs as Americans consider the potential use of gene editing and devices implanted in the brain to augment human abilities. Third, women tend to be more hesitant than men about wanting the enhancements potentially available from these cutting-edge technologies. They are also more negative than men in their judgments and expectations about what such enhancements would mean for society. Interestingly, although majorities of the public expect these enhancements would lead to increased social inequality, there are, at best, only modest differences in attitudes about these topics by race, ethnicity, educational level, income or age. 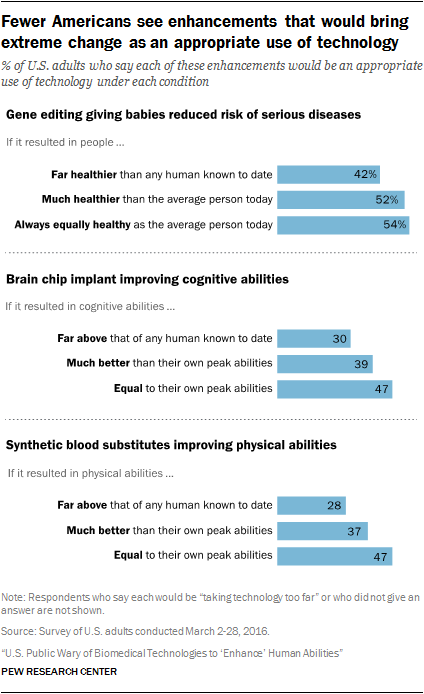 Finally, there are some similarities between what Americans think about these three potential, future enhancements and their attitudes toward the kinds of enhancements already widely available today. Many are skeptical about the need for cosmetic procedures and other current enhancements. For example, 61% of Americans say people are too quick to undergo cosmetic procedures to change their appearance in ways that are not really important. 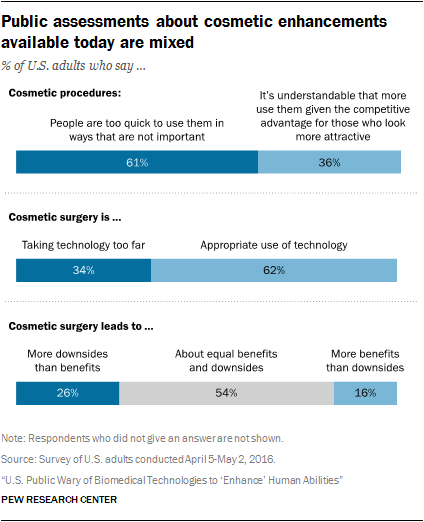 Roughly a third (34%) say elective cosmetic surgery is “taking technology too far.” And, overall, 54% of U.S. adults say elective cosmetic surgery leads to both benefits and downsides for society, while 26% express the belief that there are more downsides than benefits, and just 16% say society receives more benefits than downsides from cosmetic surgery. Human enhancement encompasses a wide range of biomedical interventions intended to increase human abilities. In simple terms, this means making biochemical, surgical or other changes designed to improve cognitive, psychological or physical capacities, and can include changes aimed at bettering physical and mental health. The modern discussion of human enhancement often is traced to an essay by Julian Huxley in 1957. The essay suggested the human species could “transcend itself” through biological intervention.3 Over the millennia, people have tried to improve their abilities by learning, as well as using tools and gadgets. Enhancement is different from those attempts at human betterment because it involves biomedical intervention in the body to notch up a person’s capabilities. Many also think about human enhancement as distinct from therapeutic interventions. Thus, medical treatments aimed at restoring a person’s ability to see or hear – for example, to regain motor control after a stroke or spinal cord injury – would stand in contrast to enhancing abilities in otherwise healthy and well-functioning people beyond their current capacities (or some typical level).4 The line between therapy and enhancement often is blurry, but this distinction provides a framework for thinking about human enhancement in everyday terms. Until now, biomedical scientists have had the capacity to make only relatively modest enhancements in people. However, the convergence of innovations in biotechnology, nanotechnology, information technology and other fields is raising the possibility that future enhancements could enable much more dramatic changes to human abilities. The pace of innovation is difficult to predict and sometimes takes much of the scientific community, let alone the broader public, by surprise. The development of CRISPR, a gene-editing technique, is one example in which potentially far-reaching techniques evolved very rapidly, within the space of just a few years. The three future-oriented scenarios are meant to reflect the range of enhancements being discussed by scientists and others as potentially on the horizon, but it is by no means an exhaustive list.6 None of the techniques behind these ideas is being used for “enhancing purposes” today, although all exist in some form of development for therapeutic or medical applications. They were chosen in part because they each raise potentially enticing prospects. What if we, as a society, could virtually do away with illness? What if humans could all raise their thinking capacity manyfold? And what if synthetic “super blood” could boost physical prowess to “superman” and “superwoman” levels? Whatever appeal these ideas may have, they also raise fundamental questions about what it means to be human. From the earliest days of civilization, people have sought to better their condition through the use of tools, medications, surgeries and other therapies. But as new scientific and technological breakthroughs arise, so do questions about whether such developments move beyond limits set by God, nature or reason. Thus, this research is aimed in part at understanding where, if at all, the public might “draw the line” on human enhancements and the possibilities they could bring to society. To enrich the survey findings, Pew Research Center conducted six focus group discussions around the country. “American Voices on Ways Human Enhancement Could Shape Our Future” examines the themes that arose in these discussions, many of which focused on where to draw the moral and ethical boundaries when considering scientific breakthroughs that could enhance human capabilities. The calculations and guideposts people use have a distinctive character depending on type of enhancement. For more detailed results and quotes from these in-depth discussions, see the accompanying report.